This year’s D23 Expo sees the return of StorePass, StagePass and the Overnight Queue. These three options are a great way to help guests get the most out of their D23 Expo experience, but can be overwhelming, so to continue this week’s series of D23 Expo themed TMSM Explains articles we wanted to take some time to explain these three options to you! What Is The Overnight Queue And How Does It Work? Back again is the overnight D23 Expo queue. The “camping line” is only available on Thursday and Friday night, there will not be an overnight queue on Saturday night. 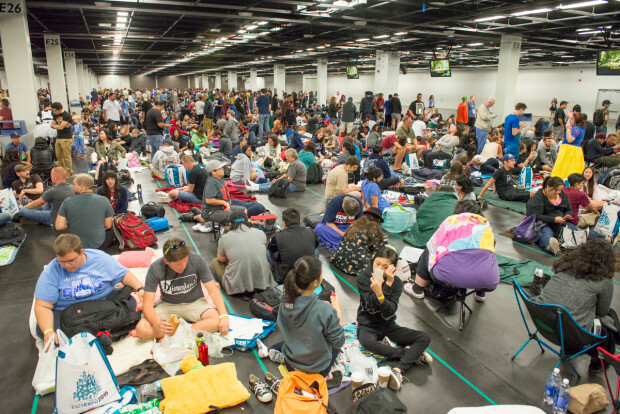 The overnight queue is only for guests wishing to attend the first panel in Hall D23 on Friday (Disney Legends) and Saturday (The Walt Disney Studios Live Action Film Panel) and the Expo show floor. Please remember that camping overnight does not guarantee you a seat in these panels or the ability to purchase select Limited Edition items. Lineup for this line will begin at 10pm on Thursday and Friday night. Because there won’t be a camping line on Saturday night, the line for the Show Floor and Hall D23 will start on Sunday morning at 6 am. at the Grand Plaza in front of the Anaheim Convention Center. If you are camping please know that any items you bring must be stored in a backpack or smaller bag as D23 will not be allowing you to leave the line to store your items as there will be NO re-entry and “all members of your party must be present (no holding space in line for others to join later).” There will be concessions and bathrooms in the overnight line area. What Are StagePass and StorePass? Think of StagePass and StorePass as the D23 Expo’s version of FastPass. Both options are free and are a part of your admission to the Expo, but both have limits and rules. StagePass is designed to help you enter panels in certain halls, and StorePass is for Shoppers. StagePass is not available for sessions taking place in Hall D23 and only one StagePass ticket can be issued per time block per Guest. To receive a StagePass please visit the StagePass Distribution Center located in Hall A. Select which session you wish to attend for the time block. Also select an alternate session in case tickets for your desired session are no longer available when you reach the ticket booth. You will then present your D23 Expo admission ticket to receive one StagePass ticket for your selected session, any guests getting StagePass will need to be present to get their StagePass. Arrive at the venue by 15 minutes prior to the start of the show with your StagePass ticket. If you do not arrive by this time, your seat will be filled by standby Guests as seating is filled on a first-come, first-served basis and are not assigned to a specific seat. Your StagePass will only let you enter a panel, all guests wishing to enter a panel will need to either get their own StagePass or stand in the general line. How Does Store Pass Work? A limited quantity of StorePass tickets will be available for priority entry to the following D23 Expo shopping locations: Disney Dream Store, Disney Store, and Mickey’s of Glendale. Guests are limited to one StorePass ticket, until inventory is depleted, for a single shopping location each day. There will be standby queues at all locations if you do not get a StorePass. Starting at 9 a.m., and while tickets last, visit the StorePass Distribution Center in Hall A. You can choose one shopping location and your preferred 30-minute time slot between 11 a.m. – 5 p.m.You will then present your D23 Expo admission ticket to receive a same-day StorePass ticket for your chosen shopping location, any guests getting StagePass will need to be present to get it. You will need to arrive at the shopping location at least five minutes prior to the start of your assigned time slot with your StorePass ticket. StorePass tickets are valid only for the time slot printed on the ticket on the day the ticket is distributed. Your StagePass will only let you enter the store.